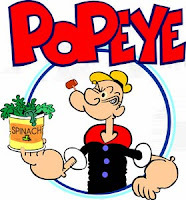 While the original Popeye cartoons came out long before my time, I still remember watching the re-runs as a kid. What a great cartoon and a fun way to teach kids to eat their vegetables and lay off the burgers! Here you have this small, scrawny, big-hearted sailor (with the most amazing forearm development of all time) who as able to turn himself into superman with the help of a true super-food - spinach! While the fact that spinach is good for you is not new, many people do not understand the tremendous health benefits of this green goodness and fail to make regular spinach consumption a permanent habit - it is time for that to change! This week our 52 Weeks to Better Nutrition and a New You series, it is time for you to super-charge your body with this super-food! Add spinach to your Power Shakes (I know this sounds gross, but the mild taste of spinach is easily masked - all you have to do is get over the fact that your shake is now green). Spinach salads are a great options here. Add other chopped veggies (e.g. tomatoes, onions, peppers), nuts (e.g. almonds, pine nuts, etc - watch for allergies), fruit (e.g. chopped strawberries or orange), drizzle with olive oil and sprinkle with sea salt and seasonings. 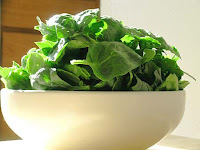 Another great option is to lightly steam spinach (on its own or with other vegetables) or add it to stir fries at the last minute of cooking. I know a lot of people these days are really into the raw food concept. I'm all for raw food, but it is not always bad to add some heat. Lightly cooking spinach is a great way to release the iron. It is also helpful for people with sensitive digestive systems who may find certain raw foods irritating. Another cool benefit for the high-performance athlete or those interested in muscle gain is the low volume that cooked spinach has. Many people in these categories claim that they are so full after eating all the protein, fats and carbs they need that they cannot possibly squeeze in vegetables. However you can easily put 2 huge handfuls of raw spinach into the steamer and very quickly have it down to a very small serving of veggies. No more excuses not to get some greens in your diet. The one objection I have to Popeye is that he ate canned spinach. I would stick with the fresh version. 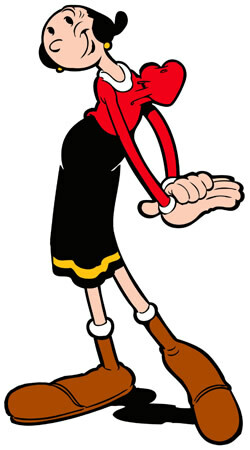 Stay tuned for next week's nutrition habit when we'll look more at Popeye's beloved, heart-healthy Olive Oyl!